It is extremely important to me that my children are well-grounded in the basics - reading, writing, and especially math. I've mentioned before that my girls sometimes struggle with math, so it's always good for me to find ways to supplement their math curriculum. This summer was a mix of maintaining the math skills they already have while trying to improve the areas they are a little weaker in. Having access to all grade levels through the Homeschool Membership from CTCMath was extremely helpful in allowing them to do that. 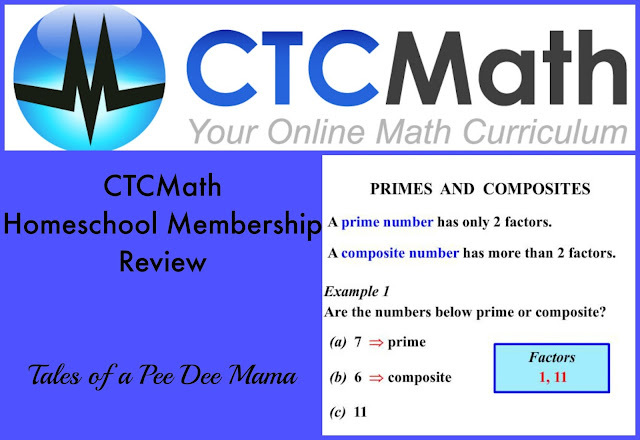 For this review, we received a one-year subscription to CTCMath Homeschool Membership. This membership includes access to all lessons at all grade levels and can be used for up to 10 children. We are using it with all four of the girls. We had the opportunity to review CTCMath last year, so I was excited to have the opportunity again this year. From there, the younger girls could choose the skills they most need to work on (or in the case of one child, avoid the one skill of Roman numerals that she absolutely hates LOL). Never fear, she will be returning to hit those lessons this year. As you can see, the levels completely cover any and all skills that a child might need to work on or review. CTCMath is so comprehensive that I could use it as my only math curriculum if I chose. Each lesson is comprised of 2 parts: a video and a set of questions to answer. The video is very easy to follow. The information is presented orally and visually, which is great for my girls who need the information to be presented in multiple ways. I like that the visual information is presented in a clean, uncluttered format. That helps keep my easily distracted ones focused on the information they need to be learning. This is a screen shot from the video on prime and composite numbers so you can see how well organized the video is. The set of questions are also presented in a clear, uncluttered format. At the top is a progress bar, so they can see how they are doing within that question set. After answering each question, they get immediate feedback on whether or not their answer was correct. One of the features I most appreciate about CTCMath is the weekly report that is emailed to me each week. The report comes as a PDF attachment to the email and contains an activity log for the week as well as a summary of each of my children's performance that week. The activity log tells me the day, the time logged in and out, and the time for each lesson viewed or questions answered as well as what lesson it was. It also provides me with the percentage correct for the questions that were attempted. I like this because I can see at a glance how each child is doing and if they are spending enough time on the program since I asked them to work on it for 30 minutes each day during our summer break. I plan to continue to have the girls use CTCMath when we start back to school next week, but it will be used more as a supplement to the math curriculum they will be using. Because we have access to all of the lessons, I can have them go as needed to a specific skill lesson to have more practice on the skills they are working on in their curriculum. Are you interested in what others have to say about CTCMath? Check out more reviews from the Schoolhouse Review Crew.